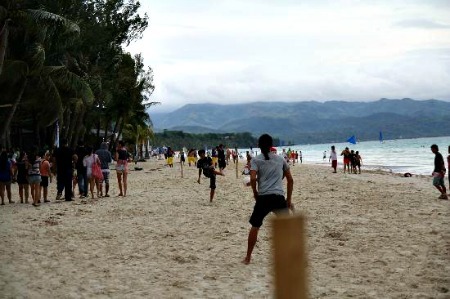 Hundreds of football players and enthusiasts will troop to Subic Bay on May 12 for the Luzon Beach Soccer Eliminations at the Lighthouse Marina Resort beachfront area. Eight men's and eight women's team are set to battle it out for the right to represent the island at the National Beach Football title late this year. "(We have) been organizing the Luzon Beach Football Eliminations in Subic since 2000 and we consider (Subic Bay) our home already," said Beach Football Association of the Philippines (BFAP) secretary-general Rea Villa. Raul Marcelo, deputy administrator for tourism of the Subic Bay Metropolitan Authority (SBMA) welcomes the decision of the BFAP to hold its tournament in the area. "Subic Bay is now a top destination for national tournaments. And football, with all its variants namely association football, futsal and beach football, are one of the sports that we want here," Marcelo said. Supported by the Subic Bay's Lighthouse Marina Resort, the tournament will also feature the Lighthouse Amihan Football Club (LAFC), Subic Bay's official team. The LAFC copped the silver in the 2011 edition of the tournament, and if at full strength, is expected to do well in the tournament. "The participants, mostly Manila-based teams, find it convenient to travel to Subic to play beach soccer because of improved roads, secured venue, great shopping outlets and a lot of other activities that they could do after the tournament” Villa shared. This year, BFAP will adopt the international beach football rules to align the tournament with the international rules and standards. BFAP was founded by Dr. Ahmed 'Mike" Athab who used to be the University of the Philippines Women's Football Varsity Coach and is the current Beach Football Committee Head of the Philippine Football Federation (PFF). The Philippines participated in the 2006, 2008 and 2013 World Cup Beach Football Asian Qualifiers and is planning to prepare for the Asian Beach Games 2014 and the next World Cup Qualifier in 2015. Villa added that BFAP partnered with the Lighthouse Marina Resort because of its excellent facilities and amenities. "Its scenic view and ideal location makes it a perfect place to conduct the tournament Subic," she added.